I recently bought the Wisdom 2 iOS app because I had heard good things about the previous version and found a great deal for it on the iTunes store (Apparently it has been reduced to $11.99 from around $30 until the end of this month). 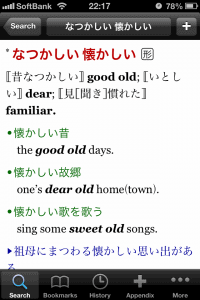 I have been using the dictionary for the last couple of weeks and have to say that it has already taken a central role in my Japanese studies and my everyday life too. Often, I find myself talking to friends or colleagues and have a word on the tip of my tongue that I just can’t remember. Other times, I wonder how to say a certain phrase in Japanese that I have never considered before or want to explain a concept to someone but my explanation is faltering from a lack of active vocabulary. Normally, if this was a language exchange or some other event where I would expect to practise Japanese, I would bring my electronic dictionary but it’s not exactly practical (or sociable!) to whip your Seiko out in the middle of a crowded izakaya. iPhone apps are much quicker and more convenient in those situations. That’s where Wisdom 2 comes in handy. I haven’t really used Wisdom 2 for long study sessions although I’m sure it could be used that way. I think of it more as an on-the-go kind of dictionary that helps me look up words speedily when I don’t have a PC or dictionary at hand. I read through the example sentences a lot and also like the fact that you can directly look up any unknown words from the example sentences by simply holding down the word. As this is a dictionary in the classic sense, there aren’t many study tools or review options for learning the new vocabulary. There is a fairly simple bookmarking function though (that incidentally backs up to iCloud) that allows you to save new words for later. Wisdom 2 is based on the “Wisdom English-Japanese Dictionary 3rd edition” and contains more than 100,000 entries, which should be enough to keep you busy. Although it comes recommended for people like us who study Japanese, Wisdom 2 has evidently been made with Japanese learners of English in mind. If you are just starting out in your Japanese studies, you should be aware that the app’s interface is only available in Japanese so you should be at least an intermediate Japanese reading level before considering this. – Character size settings can now be modified more precisely. – A clipboard search function has been added. By turning “Clipboard Search” on in the settings menu, you can now search text copied from other apps when you start up Wisdom 2. – Problem fixed for display of invalid characters in the Japanese-English dictionary contents. – Problem solved for iPhone/iPod touch when text selected for an extended amount of time remains displayed even after the selection has been cancelled. – The viewing history is now also updated when a word is chosen from within the viewing history itself. – The functionality for clearing previous searches has been improved. 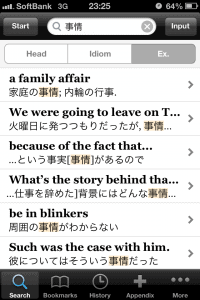 All in all, Wisdom 2 is a valuable tool for learning Japanese. 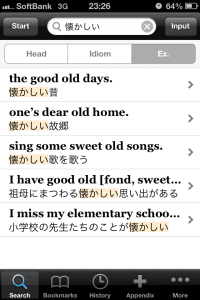 If you are serious about learning Japanese, then this app is a good choice. Check it out and tell us what you think! P.S Yes, an update is coming for the Japanese Firefox plugin and due to feedback from a fairly loud minority of users, the names dictionary will return. Watch this space! We’re still trying to figure it out, but Perapera Language Tools is now on Google Plus. Follow us over there or on Facebook to receive updates on our latest linguistic endeavors.